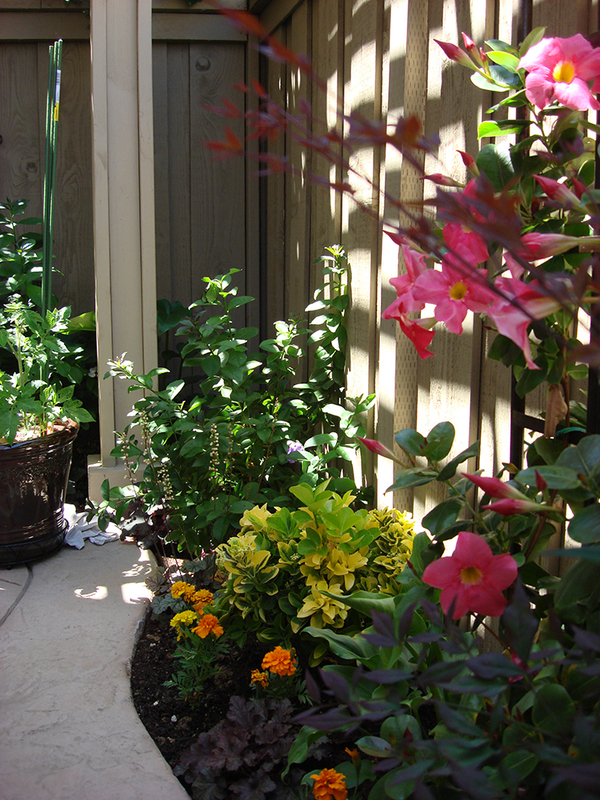 Breceda Landscape has over 30 years experience as a professional landscape company. 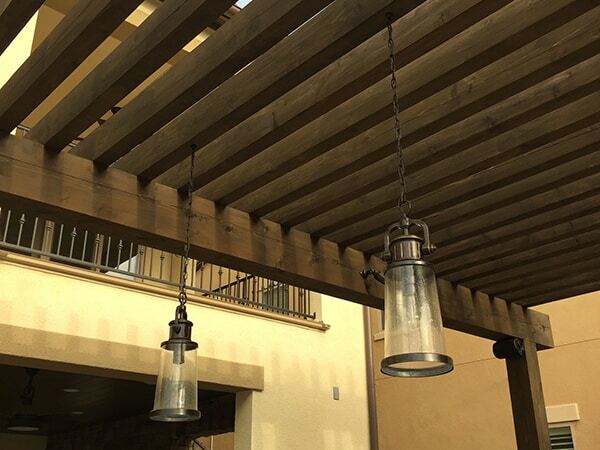 Based in the San Diego area, the Breceda Team works closely with our clients to create and develop an outdoor living space of their dreams. Breceda Landscape specializes in all aspects of landscape projects- design, installation, and construction to renovate your existing landscape or the installation of a new landscape. 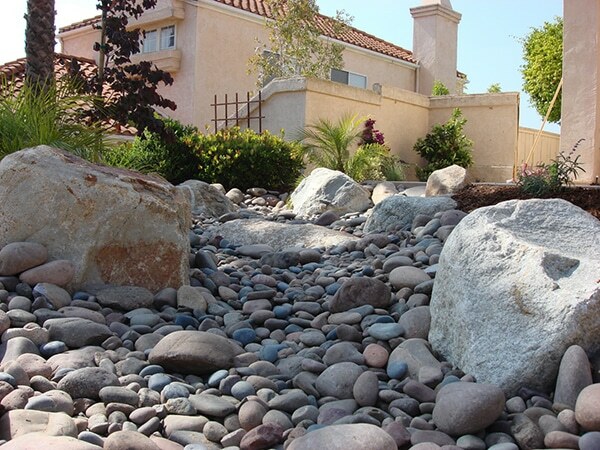 We install innovative irrigation drip systems, water harvesting systems, and water-wise sustainable landscapes to include rock and boulder work with realistic gorgeous dry river beds. 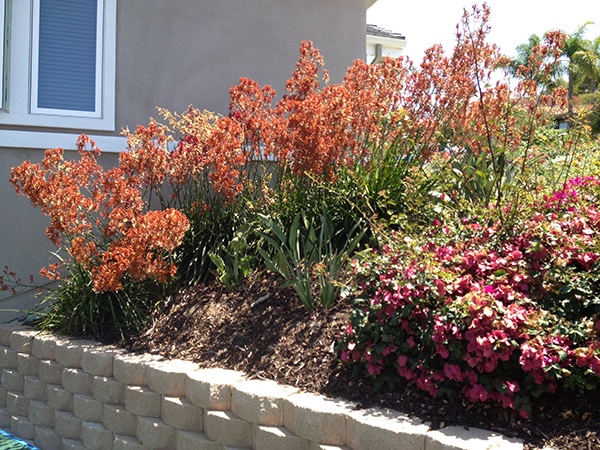 The San Diego climate provides a perfect microclimate to encourage a diverse plant palette for everyone's personal preference. Water features with wonderful fountains or flowing riverbeds for you to appreciate. Outdoor kitchens, fire pits and custom fireplaces can extend your living space for total enjoyment. 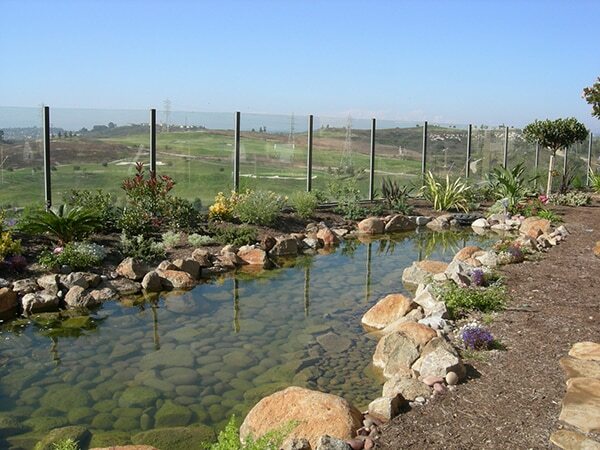 Now is the time to think about your unique San Diego Landscape, and allow the Breceda Team to assist you to achieve your total landscape vision. We have had a LOT of contract work done on our home over the years, and Breceda Landscape stands out as one of the BEST contractors we have worked with. Our clients tell us our attention to detail is what has made their experience designing their perfect landscape so enjoyable. Get in touch with us today so we can provide you the same level of satisfaction. 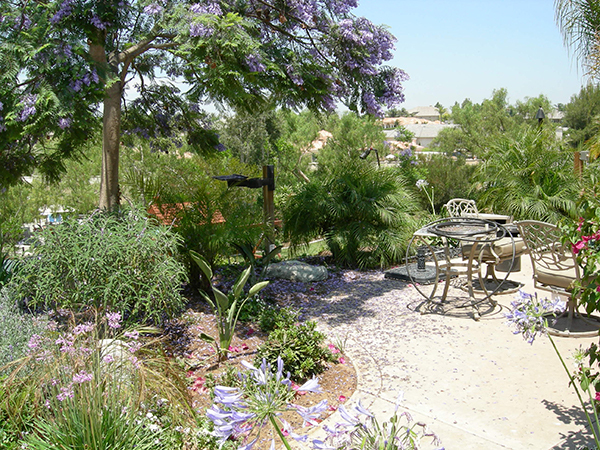 San Diego is a unique climate for landscaping. We pride ourselves on finding the right landscaping for our clients in design, cost and function. Your landscaping should include all your favorite design aspects. We install the plants, irrigation systems and hard-scape aspects that will provide you with a beautifully sustainable and efficient property. Our experienced landscape team will meet with you at your home, to review your goals in detail. Often our clients chose to save the money spent on a formal design by using our years of experience and skill to design the landscape with our contractor direct. A formal design can be achieved at a cost that can be quoted. We enjoy the involvement of our clients with all aspects of the project. You live at this property and should have direct input. You will choose the basic planting theme and the main elements that you want in your landscape. We schedule trips to vendors to actually go out personally to look at plants and materials to select them with you. We then will review the landscape design and go over the plant list and materials details. You will also receive a full installation estimate for your project. We will aim to stay within the budget that you gave us at the start of the project. Often there are revisions and we are happy to discuss your ideas and changes to the design and estimate. Our goal is to create a wonderful outdoor space that you can enjoy for many years. Our policy is that we don’t believe you should re-do your landscape unless you are making significant changes. 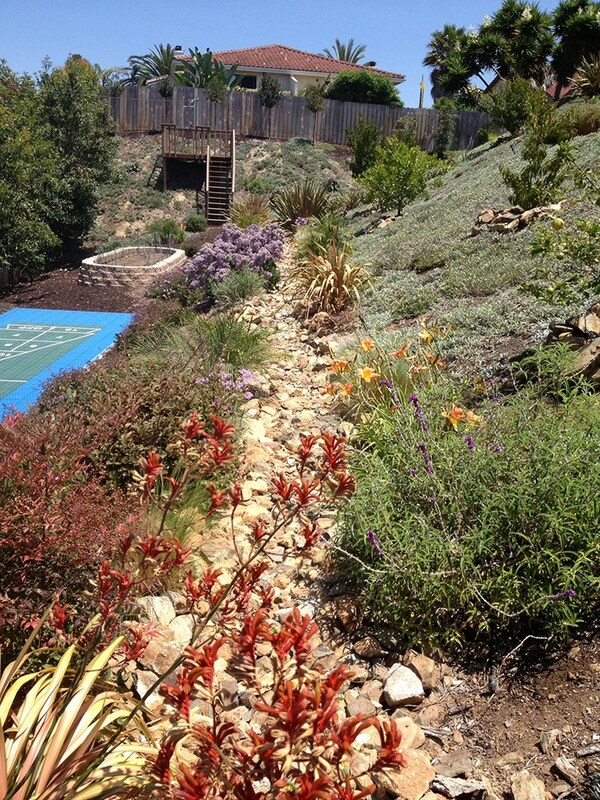 So what can Breceda Landscape do for you? Today we can design & construct anything you desire for your living space. Concrete, pavers, natural stone, flagstone, DG, granite, wall block, wood & tile are just some of the material elements we have the experience and skill to work with. 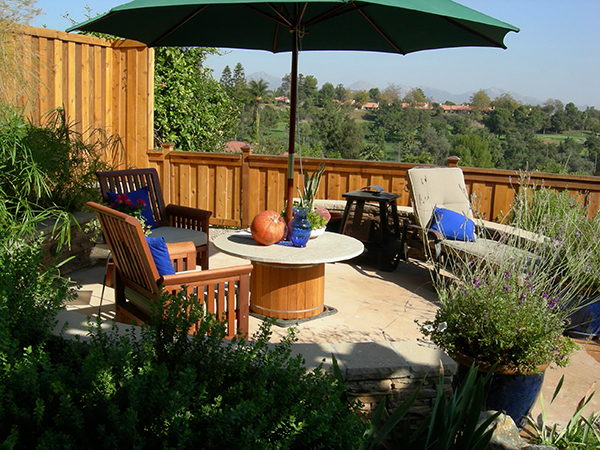 Extending your usable outdoor space is a wonderful option to add enjoyment to your property. There are several different options for materials and style. Concrete, colored or with in-lay. Pavers come in many different colors, patterns, and shapes. Flagstone is a natural flowing look. 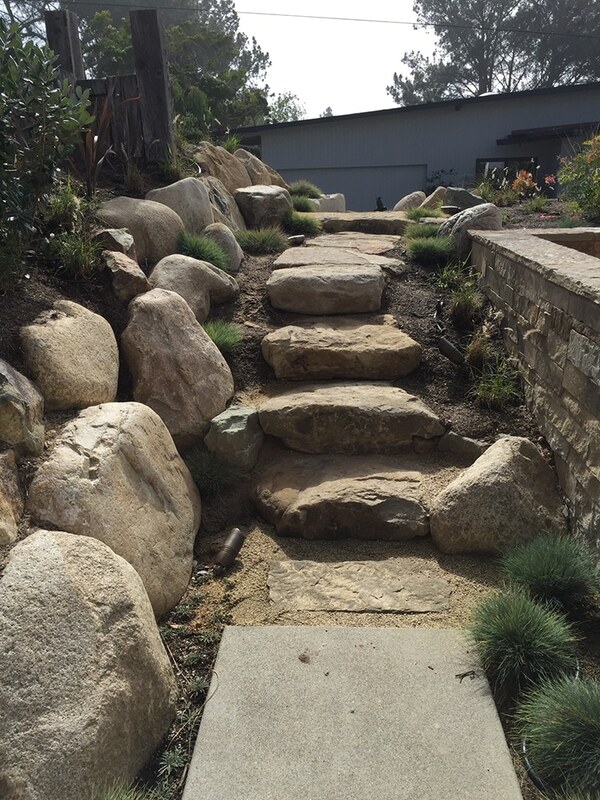 Some clients like to use different rocks or DG- decomposed granite. We can help you to select the materials to fit your lifestyle and look you are trying to achieve. Retaining walls are used for many different reasons. Usually to control elevations in the living space or to expand the living space. At times the walls are used for erosion control or to assist in drainage issues. We will assist you in deciding the type of wall you will need, and the materials used to put the wall in. 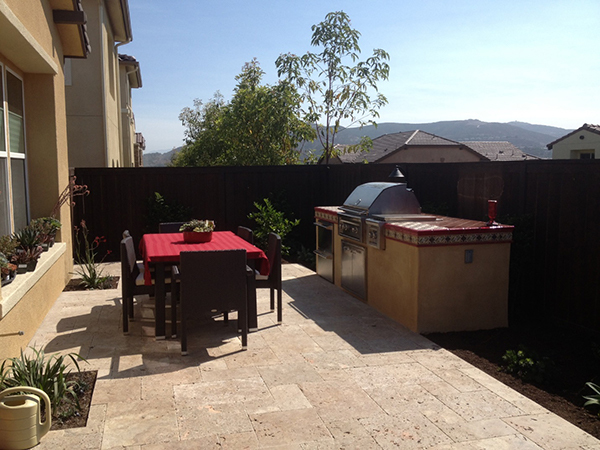 There are so many options to think about when you are deciding on the type of outdoor kitchen space you will need and use on your property. We can help you design the perfect space, with a gas or propane BBQ, electrical options for your fun kitchen utensils, refrigerator, and sink. A usable workspace to cook and a counter area for your guests to visit with you as you grill up a lovely meal. Any water feature you decide to add to your design brings beauty and charm to your new landscape space. We can help you select a fountain from a local vendor, or build a custom fountain. 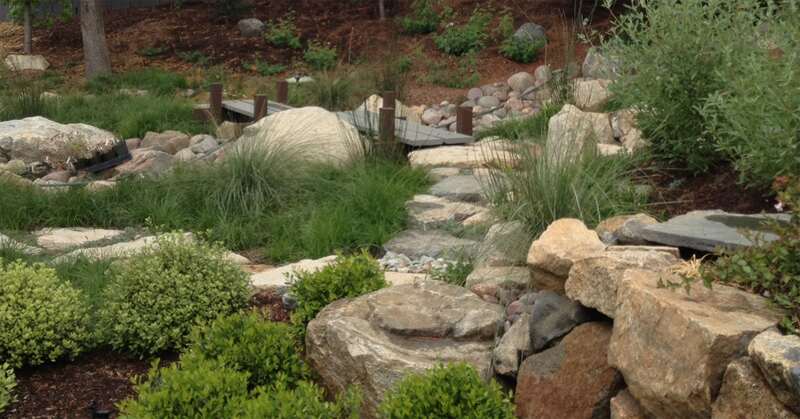 We can build a pond, waterfall or stream for a different look and element. Our team can guide you to the creation of a peaceful space to enjoy. 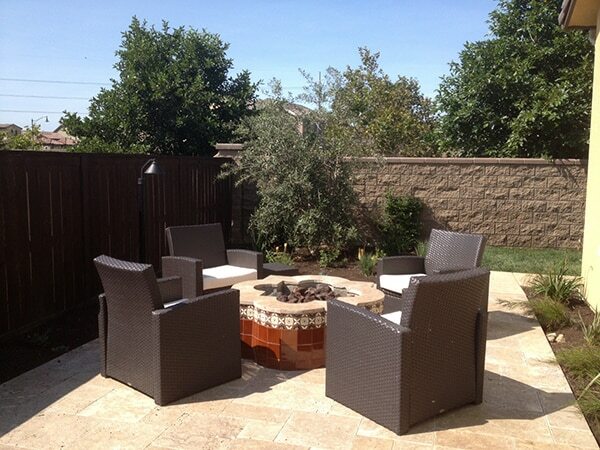 Who doesn’t enjoy sitting with friends and family around a fire pit or fireplace? We can design and build your fire pit or fireplace so you can use gas or if you want to use wood for a natural touch. Free standing wood structures add another element to your front or back yard living space. There are many different styles and options out there. We will assist you in the selection of style, size, and materials. Our professional team will construct you a beautiful addition to your living space. We do more than install sprinkler systems. Because of the unique nature of our weather in San Diego, most San Diegan’s face both watering restrictions and flooding at some time in their homes. These both can be controlled with properly designed landscape, irrigation system and drainage system. Eric Breceda has a passion for creating water saving and unique irrigation systems. He has worked closely with a big name irrigation supply company to develop a drip system that not only is extremely efficient, but also is sustainable, easy to maintain and has great durability. Eric’s drip systems are adjustable flow rate* per minute drip systems; which create optimum growing conditions for plants. *An adjustable flow rate tech line is a per minute drip system. It reduces consumption of water by applying water at a faster rate and reducing the quantity of water used. It is also a more desirable system than a typical micro system which has less durability than the adjustable flow rate tech line. An adjustable tech line has more versatility because it allows you to diversify your plant materials by size and plant type in the same hydro-zone. Basically, you can use different types/species of plants & sizes that have different water needs. Uses less water, is more durable and versatile. The Breceda Team analyzes your plant palette, the water needs of the plants and the existing soil conditions. These are detail’s that aide in making your plants thrive and live for a long time. Whether a drip system or spray system is deemed needed at your property, we make sure your plants get the appropriate amount of water to keep them healthy. We are also Certified Landscape Irrigation Auditors to provide our clients with the best possible landscaping and irrigation advice and consultation. In the past few years there has been a surge in annual water usage the average household uses on landscaping. For just landscaping the average household spends more than $1000 per year on its water and sewer bill. By making just a few simple changes to use water more efficiently, you could save about $300 per year. Also, when we use water more efficiently, we reduce the need for costly water consumption and water supply infrastructure investments. Certified landscape irrigation auditors are involved in the quantification of landscape irrigation water use. Appropriate drainage and keeping excess water away from your home or permanent structures is extremely important. Water damage caused by improper drainage can be costly and lower the value of your property. Our team of experts will assist you in assessing the needs and costs of installing a drainage system. Effective Erosion Control is to handle surface runoff and is important in preventing water pollution, soil loss and property loss.